It's almost like being on holiday...! 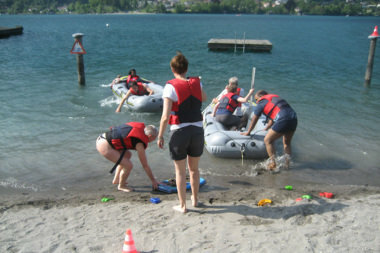 At a nice beach near Weesen or in your area, you will discover all the fun you can have with water and will see it from a totally different perspective! Genuine refreshing overwater fun as you will never have experienced before! After the instructions you will set off and, in small groups, will be put to the test at the individual points. You will use giant fishing rods not for fishing but to transport the precious water through the air and attempt to throw water balloons and discover how to best use the water. On the "ferry chase", meanwhile, things might get a little hectic and calm will be needed if you want to get the "cargo" safely through the adventure water course with the small paddle boat. 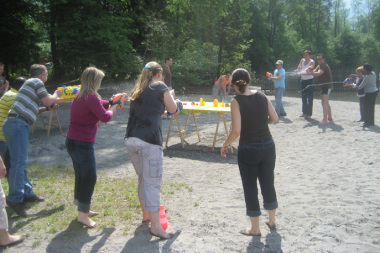 Enjoy fun and games in beautiful surroundings and always on or over the water. Even though the event takes place by and over the water you will come into contact with the "cool wet stuff" quite often. But you needn't worry! We recommend that you bring a change of clothes with you and, if the weather is warm, also your swimming things. There will be changing facilities nearby. If the weather is cool, the event can still take place but may be a little "tougher"! If you want to be on the safe side you can also book a fun indoor event (e.g. puzzle hunt, team games etc) to calm your planning nerves. Subject to a small extra cost. Nothing in particular, a love of experiencing new activities. Why not spend the whole day in the Walensee − Kerenzerberg region. The eventerlebnis local region offers many great surprises − food and drink, accommodation, great short and long events, scenic seminar locations and much more − and all from one skilled source.